I have been really tired lately. 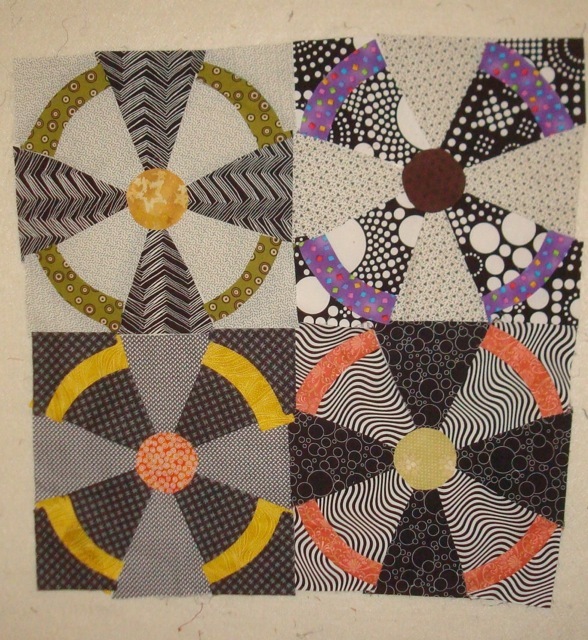 So tired I haven’t been able to get up early enough to photograph the quilts I’ve finished. I did, however, drag myself to and around Brimfield this past Saturday. I didn’t get very far, but I did see more gorgeous quilts than I usually do (probably because I was in the “higher end” fields. As I was going to the bathroom, I should this beautiful rose quilt (I’m sure it has an official name, but I didn’t bother to look it up.) 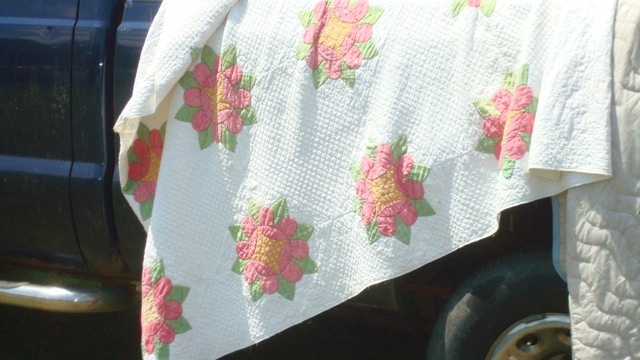 It was all hand quilted in a grid pattern except for the roses. 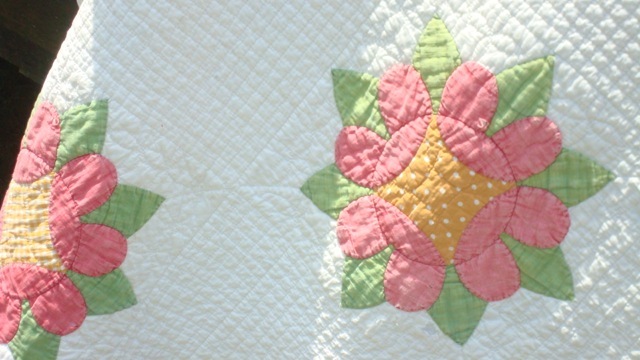 It had some problems with wear, but the quilter knew what she was doing when she appliqued and quilted this. I was too afraid to ask how much it was and if it was for sale since it was in BEHIND the booth and not actually being displayed in the booth. Airship Propellor blocks are dying on the vine and need some kind of energy injected in them to make them sing. 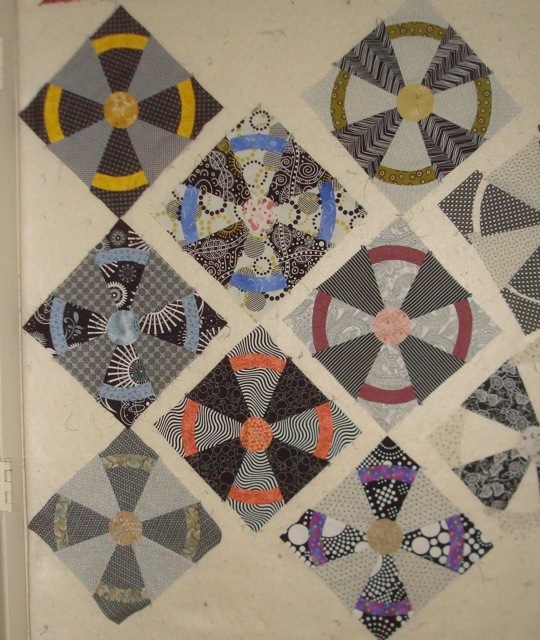 Of course, seeing these vintage and antique quilts usually makes me feel better about my projects, but I am kind of stalled on the current one. I was hoping, when I drafted it that I could get a secondary pattern going if I didn’t add sashing, but it’s not “going there” for me. And it’s not just the colors and fabrics that are not working. (Well, maybe the Black and Whites are a bit too graphic to be put so close together.) I’ve decided to piece what I’ve cut out, but not put them on the design wall until more of them are finished. An alternative layout for the Airship blocks. I’m still thinking I may have to take the corners off and float the circles. I’m also working on the border for Les Filles des Mares. It’s a simple border of half-square triangles in the same bright homespuns as the center. There was JUST enough fabric leftover from the Fat Quarters I used for the center to piece enough HST for the border, thank goodness! Nothing is left. Well, none of those fabrics. Other than that, I’m about 2/3 of the way through quilting In Full Bloom on the long arm. Probably not done this week, but maybe next. It’s turning out to be dead cute. I am learning to program the quilting block by block. I’m also writing fiction again. Yay! I hope that now that I’ve set aside a block of time to write on my novel that I will be more consistent in posting here than I have in the last couple of months. That’s it for me. “See” you (I hope) on Thursday! YAY for writing! I brushed off a short story this morning and will submit it very soon. What’s the worst that can happen? You’re brave to submit it. (I mean that in a good way.) Good luck! Thanks! Be brave! What’s the worst that would happen?